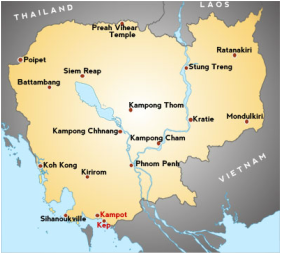 ​ Happy Hub Kampot was concepted from a need that was apparent within this community. After spending time in many orphanages, helping, donating and teaching, the founders found it very frustrating to find that a majority of the children could not only be reunited with parents, but we also saw the opportunity to support the families and children that are in desperate need. So many of these children from impoverished families are at-risk in Cambodia. Parents resort to sending their children to orphanages with the promise of a better life. Unfortunately this is not the case and these children are even more at-risk. Ensuring the children receive a good education is paramount for a bright future and the next generation of Cambodia. Alecia is a humanitarian that has worked in both Africa, South Sudan and South East Asia, helping to empower women and children. Life is crazy now for Alecia and not how she expected her life would be at this stage, but she wouldn't have it any other way. It has been such a roller coaster ride for Alecia, and everyday brings new challenges. The children are happy, safe and secure in Alecias care, now they are thriving. Volunteer work that Alecia has done over the years. Working with orphans and widows, prostitutes and ex gang members in Honduras and Nicaragua. Nicaragua was my first trip to a third world country, that trip changed my life and the vision I had for my life. Being an extremely entitled American, I was brought face to face with the poverty, starvation and desperation. That was the trip that started this journey. 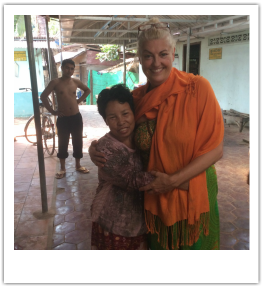 Trisha has operated many businesses and when she first went to Cambodia she stayed at a sham orphanage which broke her heart to see the children not getting the care that they required. Trish met Alecia at the sham orphanage and decided to try and do what they could do to help the children. 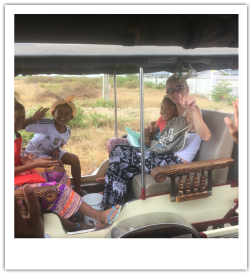 Trisha has a driving desire to help rebuild village communities so that they can earn an income that will enable families to stay together and enjoy a true Khmer lifestyle. Alecia and Trish, have teamed up to start Happy hub that will provide financial assistance to villages of the Kampot Province to enable them to farm year round for an income. Trish currently lives in Australia to manage the business and fundraising, and visits happy Hub as much as possible. Trish hopes to move to Cambodia one day. Cambodia is home to the single largest religious structure in the world, the Angkor Wat. The Tonle Sap, the only river in the world that reverses its flow annually, is in Cambodia.